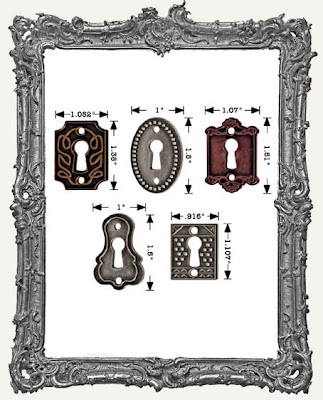 The random number generator picked Kelley from Kelley's Kreatvie Korner as the winner of the eyelet set. Thanks to everyone who played! I think I have one more to giveaway - please check back :). I want to give a BIG THANKS to Audrey Hernandez for writing this wonderful article in the latest Somerset Memories and giving me the chance to be included! 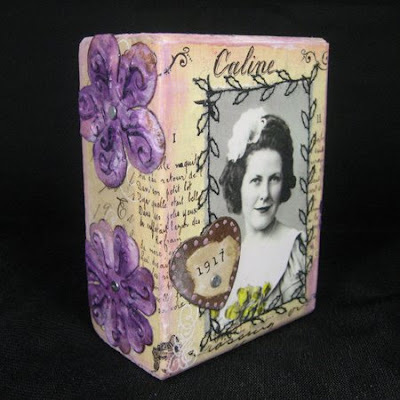 I created three "Chunky ATCs" as part of this challenge, and to my surprise all three appeared in the article! 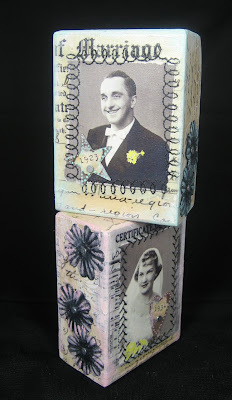 These ATCs are very special to me, as the pictures are family members that have passed. Several other fantastic artists appear in the article, so be sure to check it out! The picture in the above ATC is of my great aunt "Nina". She was always my favorite, and many people say I look like her. Also, a friend at work told me that the word "Caline" that appears at the top of the piece actually means "hug" - I learned that after the fact. Above, at the bottom of the page, you see my grandfather and grandmother. I used their wedding pictures, and as part of the backgrounds, I used scanned images of their marriage license and my grandmother's birth certificate. The dates you see on the rusty bits are their birth years. 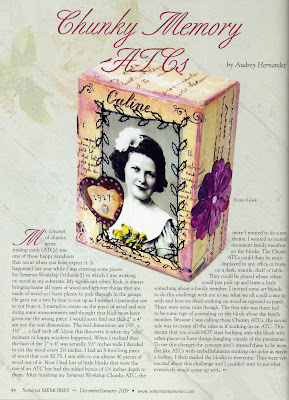 Audrey's amazing piece also graces this page! 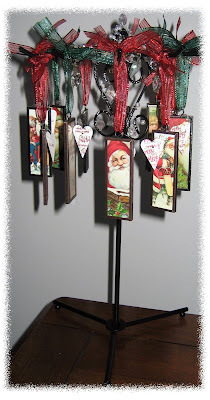 I really loved this project, and if you haven't tried Chunky ATCs, you're missing out. Be sure to get the magazine to read the full article. 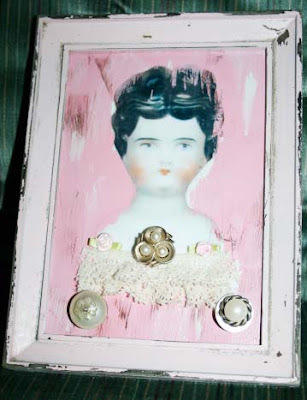 As Audrey points out, these are so fun to work with because you can nail and staple objects into the wood! 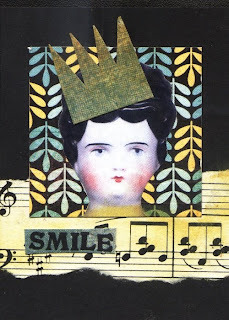 Check out this adorable sample Jackie B. made using the Hello Dollie Collage Sheet. 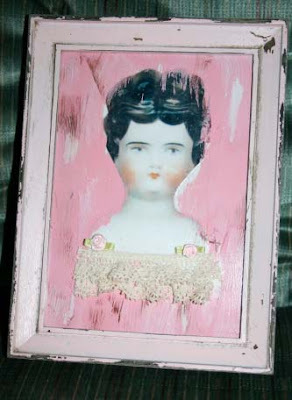 What is extra special about this piece, is that Jackie used tin as the background piece. She then created some magnets by gluing craft magnets to some buttons etc. and viola! A beautiful message board! Hi everyone! 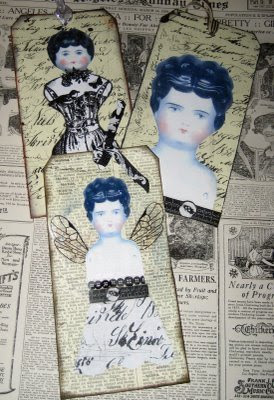 I just listed lots of new goodies on the site. Below is just a small sampling! 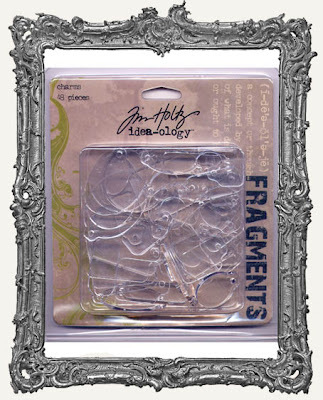 The new Tim Holtz Fragments! Charm pack and oval/circle pack. And Masks! Watch the video below and you'll want some! They are really cheap too (especially since they are reuseable). Find all the new goodies HERE!!! 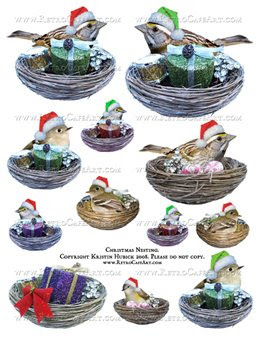 Brand New Christmas Birds and Nest Collage Sheets! 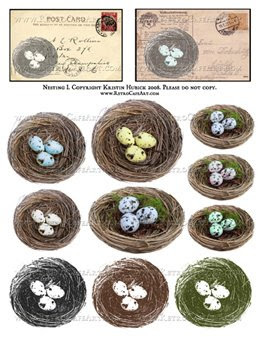 I've been hard at work to create these 4 new Christmas Bird and Nest Collage Sheets! I have one more coming in the next day or so, but wanted to get these listed ASAP for the holidays! As always, available in digital or printed sheets. I would love to hear what you think! I got this from Dawn's blog. You’re supposed to bold the things you’ve done. I had 54/100. I should have been packing orders, but this sounded like more fun :). As you know, I've really been enjoying sharing the gorgeous samples created with the Hello Dollie German Doll Heads Collage Sheet. 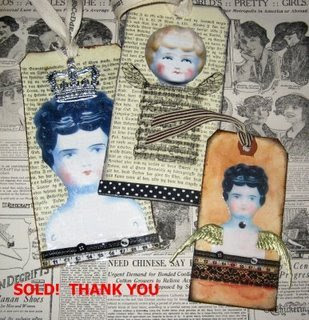 These beauties were created by the talented Sherry Goodloe and it looks like she sold some already! 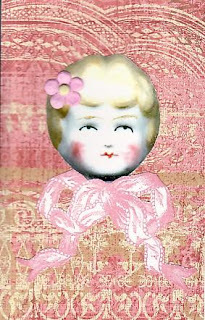 I had to share this GORGEOUS piece that Viola from the DT created using the Hello Dollie German Doll Heads Collage Sheet. You can also purchase the sheet on fabric here in my store. She printed her digital sheet on fabric and whipped up this beauty. It's even an ATC holder! Wow! An art doll that's lovely and functional! 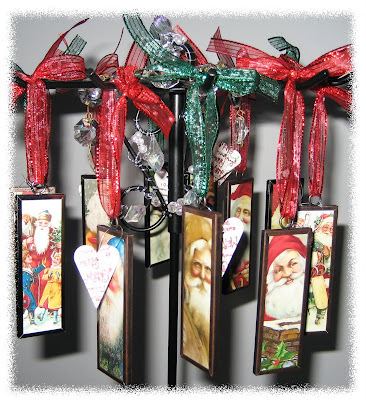 I created these ornaments for a store in Irvington that carries my jewelry and other goodies. They are a bit more simple that my usual work, but that's what was needed. 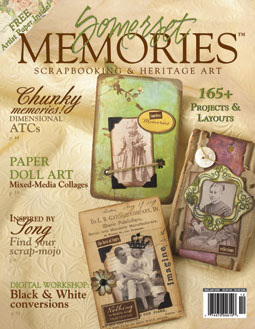 I used the Memory Frames and Memory Glass for this project and found them SO easy to work with. For someone who normally solders, this was so simple, and the ornaments came out very sweet. 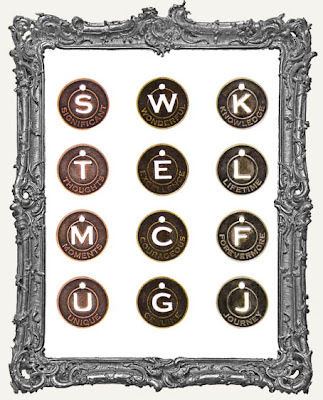 These would make great Christmas presents, especially if you personalized them. A few tips: If you don't want the glass to "jiggle" around in your completed piece, sandwich two or three pieces of card stock between your images. Also, if you want the little flap on the frame to be permanently closed, dab on a small amount of jewelry adhesive on the bottom of the flap and secure with a rubber band to hold it down until it's dry :). I think the 2" x 2" frames and glass would make great ornaments too. I really do love these Memory Frames! Quick, easy, and lovely! Ink Stained Roni - An Interview and Giveaway! Hi everyone! I wanted to invite you to go check out the amazing blog of Ink Stained Roni! Not only is Roni a fellow Hoosier, she's a fantastic artist and writer! She's in the process of writing a book as we speak! When Roni asked me if I would be interested in an interview, I immediately jumped at the chance. 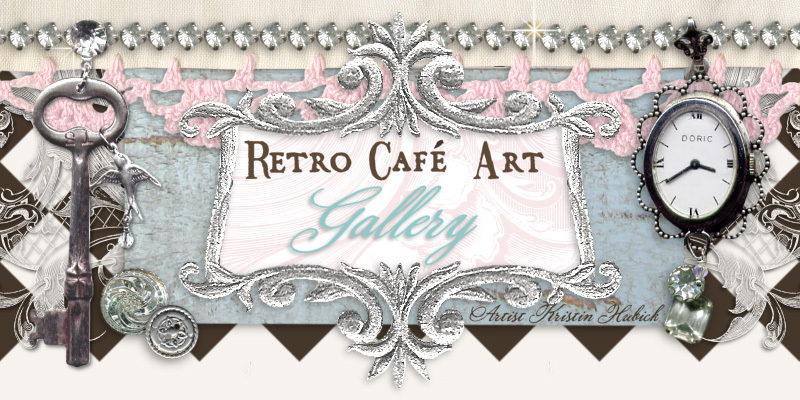 You can read the interview HERE and if you comment, you have a chance to win a FREE DIGITAL COLLAGE SHEET from my site, Retro Cafe' Art Gallery! We will pick three winners on November 25th, so go on over and play. You must comment on Roni's blog to be eligible. 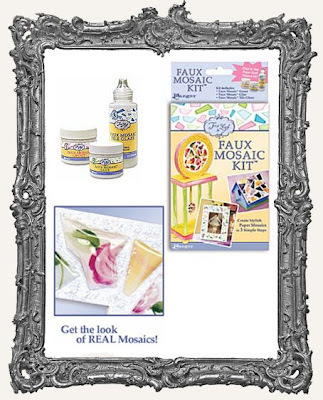 While you're there, be sure to catch up on Roni's other happenings! She is one happening chic! Another Blog Candy Eyelet Giveaway! It's time once again! As I said, I have another one of these wonderful sets to give away! 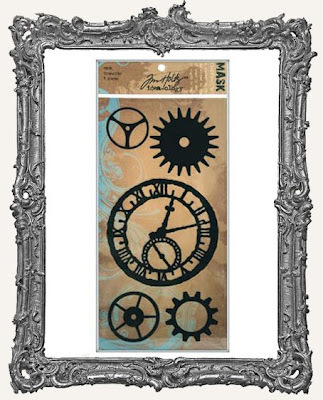 Okay, this is one giveaway you will DEFINITELY want to enter - Courtesy of Coffee Break Design. 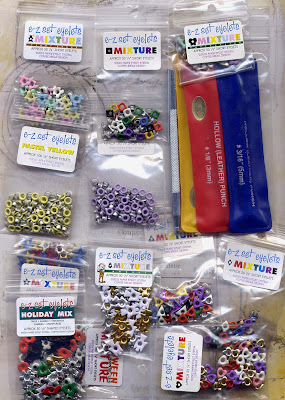 the types and shapes of eyelets include heart mixture, angel mixture, triangle mixture, teddy bear mixture, halloween mixture, pastel yellow, star mixture, diamond mixture, lavender mixture, square mixture, butterfly mixture, and holiday mix. To Enter the drawing: Post about this giveaway on your blog and link back to my blog (a giveaway like this should be shared), and then leave me a comment. I will draw one lucky winner (using a number randomizer) on Sunday, November 30th. 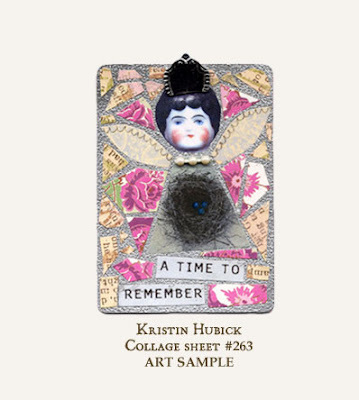 I'm really enjoying the samples from the new Hello Dollie Collage Sheet, so I wanted to share! 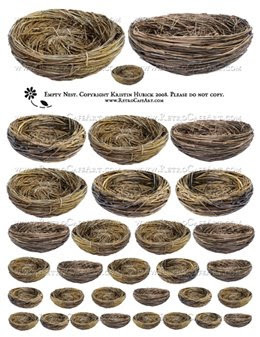 I think the images would also work great for Christmas ornaments. 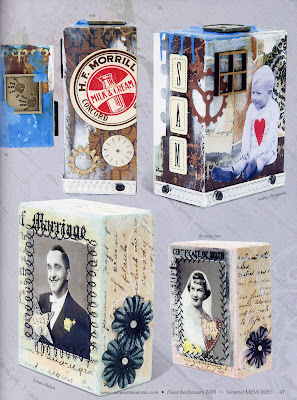 I love these sample from Gayle Page-Robak! Such creative uses. 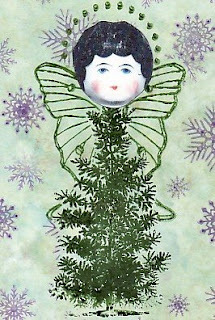 Kelly Burton created this lovely ATC. The colors and the layout are perfect! 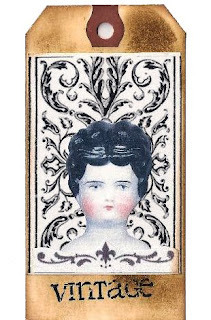 The talented Sherry Smyth just whipped up this tag using the new Hello Dollie Collage Sheet! 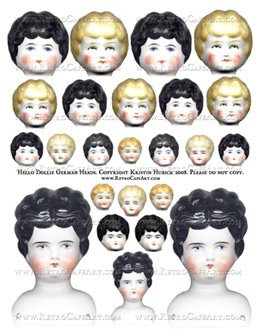 I just listed the new German Doll Head Collage Sheet! which I also listed HERE on the site :). 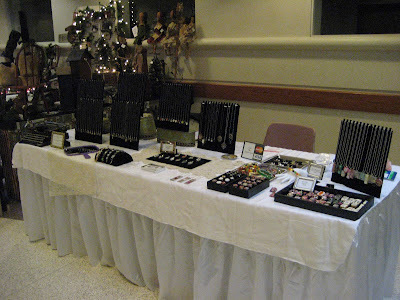 I vended at another craft fair this weekend. It was cooold outside, but nice and toasty inside :). 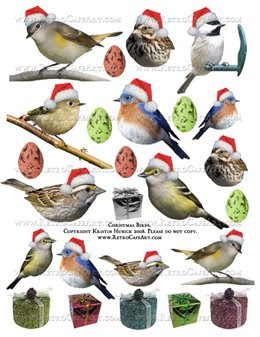 Lots of people were gearing up for Christmas - my how time flies! The Birds are Back and More! 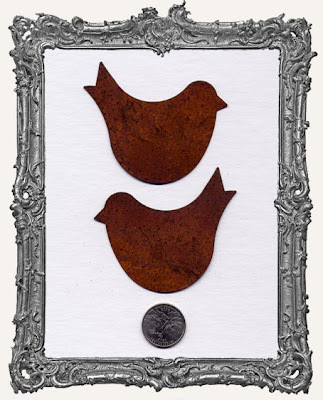 It's taken me a bit to get these back from the supplier, but the Rusty Tin Birds are finally back in stock! 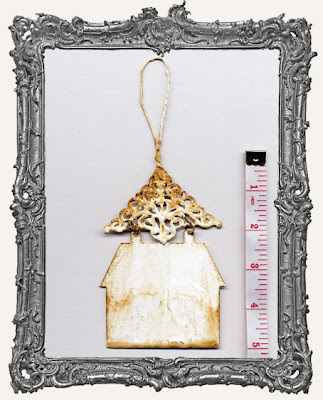 I also wanted to share these very cool Rusty Tin Distressed House Ornament Blanks! The first batch sold out instantly, but I managed to get a few more. The supplier is discontinuing them and I bought up the last they had. Perfect for Christmas! I've been tagged by my dear friend Mossy (Joanna Pierotti)! * Tag six other bloggers by linking to them. * Go to each person’s blog and leave a comment that lets them know they’ve been tagged. 1. I wrote before that I like to drink pickle juice from the jar, and this is still true, but lately I’ve progressed to drinking the juice from jars of hot peppers! I love the burning sensation as it travels down my throat. 2. I’m really paranoid about my car being hit by other car doors so I park REALLY far away at all stores/restaurants/etc. But it’s good exercise I suppose! 3. I can’t stand to wear regular clothes when I’m at home. Even if I’m only going to be home for a few hours, I put on pajamas. I’m only truly comfy at home when I’m in my pajamas. 4. I have this “rule” that when I bring something new into the house, I have to get rid of something else. For example, I added a shelving unit to one of my art rooms, so I got rid of a fake tree that I’ve had for almost 10 years. It’s my way of keeping down the clutter. 5. 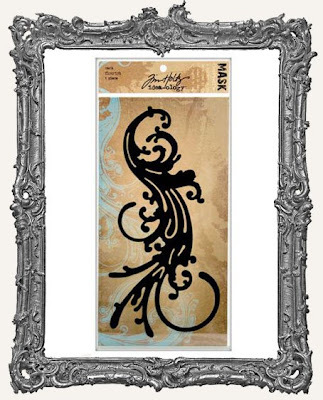 I can’t stand to touch silk – I feel like it sticks to my fingers and just thinking of touching it makes my lips curl! 6. I hate shopping unless it’s for art supplies.